In our opinion, the Telescopic Ladder is probably the most innovative access product to hit the market in recent years and our latest Soft Close Telescopic Ladder has taken this to the next level. There are many inferior products in the marketplace that are neither as safe, strong nor durable. Put simply, this is the best Telescopic Ladder available. 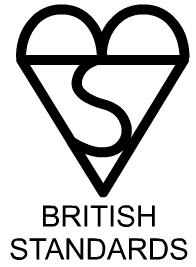 Holds the prestigious GS Mark which is the German equivalent to British Kitemark for your assurance of quality and safety. Very strong - maximum load 150kg (23.5 stone), yet light - only 10.3kg - 13.3kg, it is easily carried, transported and used on the job. Positive lock indicators (see images below) signal green if it is safe to climb and red if it is not. These are a great visual aid to check your ladder is safe to use. 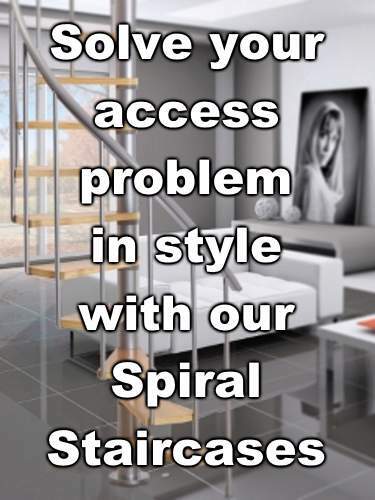 Extremely compact for easy storage unlike those with rung spacers which make the ladder much larger to transport & store. Perfectly fits into cupboard, under the bed or in a car boot. Bevelled, large rubber feet fitted to protect floor surfaces and give great grip over a variety surfaces. 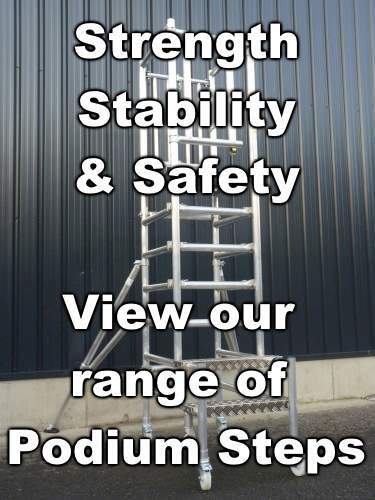 Ladder opens and closes "rung by rung", meaning that it can be used at multiple heights up to 3.21m (10’7”) or 3.87m (12' 8").You open only to the height required giving great manoeuvrability, particularly in confined spaces. Shortly we will have a video showing a deflection test of our ladder VS cheaper ones on the market. You will see how rigid and strong our model is compared with how flexible & bouncy the cheaper ones are. 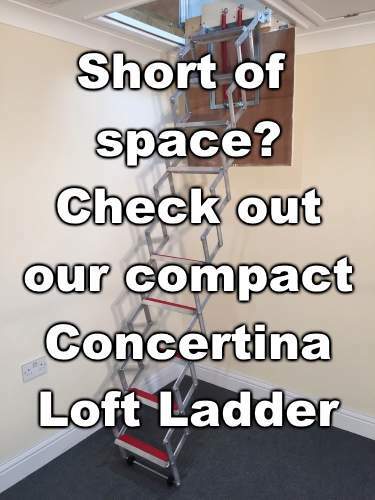 Very useful as a loft ladder as can be stored easily due to its compact size. Anodised aluminium finish - clean to touch and not “oily”. 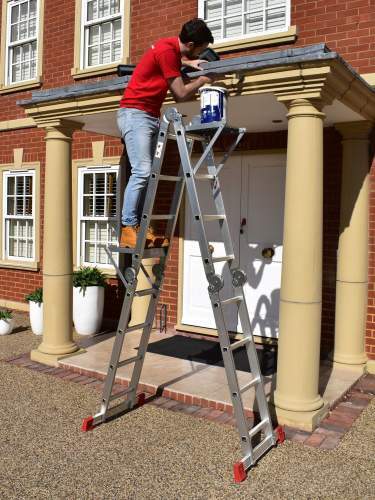 Our Soft Close Telescopic Ladder has many applications both at work and around the home and is ideal for indoor and outdoor use. An ideal "piece of kit" for surveyors, all building trades and householders. 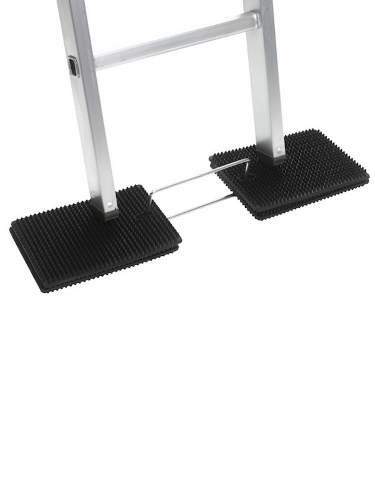 We strongly recommend you use a Levelling Mat with this Soft Close Telescopic Ladder as it provides adjustment for uneven ground but also provides enhanced grip on smooth or slippery surfaces. Available at a special offer price of just £19.99 (usually £24.99) with this ladder! 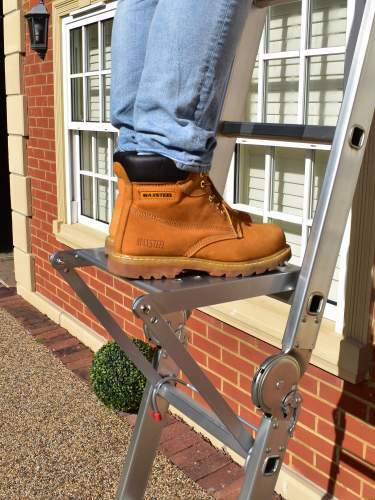 Our Step Platform is simple to use and with its non-slip generously sized platform it provides you with a comfortable and safe solution when working off a ladder. Why not upgrade to 2 x Step Platforms? One will provide you with a non-slip generously sized platform and the other can be used as a handy tool tray. 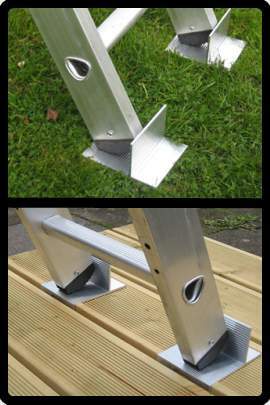 Our Universal Grass/Decking Gripper allows you to secure your ladder on grass or decking. Each pair of grippers has a non-slip surface and can be used on any width ladder. Only Telescopic ladder on the market fully certified to EN131-6 a brand new standard solely for telescopic ladders. Others just conform or are tested to outdated EN131 standards.